I am a huge advocate of homeschooling through the high school years but I am also willing to admit that some courses are out of my league. The beauty is there are so many options available for homeschooling families today that tackling these courses head on is not a problem. Science, for instance, has never been a favorite course of study for me so teaching Homeschool science doesn't exactly excite me. Thankfully, I don't have to do it alone so I was thrilled to review Biology 101 from The 101 Series. One of the characteristics I look for in a Biology course especially is that is creation based and Biology 101 is exactly that! We were also looking for simple labs and again we have found success with this course. I really cannot praise this course enough and have finally found a high school Biology fit for our homeschool. So what is Biology 101? 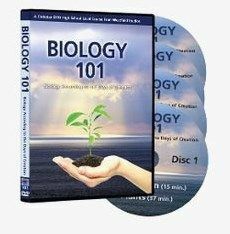 It is DVD course that teaches students Biology through the days of creation as found in the book of Genesis. Now, you can simply watch the DVDs which include over 4 1/2 hours of instruction but if you would like to dive in more, resources are available for that too. The course includes a thorough 118 page Guidebook and a 12 page Accreditation Booklet. If you do this course as suggested, it is broken down into 11 segments which create 27 weeks of course work, at approximately 5 hours per week. 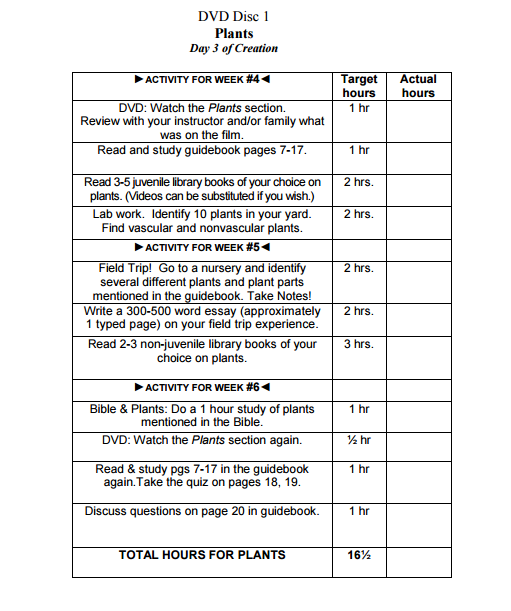 A typical week includes watching the DVD segment, reading assigned pages in the guidebook, and sometimes a field trip or simple lab option is given. The reading material reiterates what was taught in the video and adds in additional information and fun facts too. The course includes 20 hours of lab work none of which are dissections. You may add those in additionally if you wish. Labs are also easy to complete and don't require complicated materials. Sample lab work includes identifying plants in your yard, identifying parts of fish by catching one or using a goldfish, making a simple drawing of anatomy using a household pet, and many more. Additional activities include other video recommendations, reading juvenile science books, and writing simple reports with a 200 word minimum. Quizzes are available at the end of each segment in the guidebook. They are multiple choice quizzes and the answers are included as well. Here is a sample of how the credit hours can be given per segment and a glimpse as some of the weeks' activities. Our original plan was to use this course to supplement our current Biology course but after seeing what was included we have decided to use it as our main course of study. My son has been able to comprehend this so much better! The course really takes complicated terms and breaks them down simply. For instance, he was taught a very simple way to remember the female and male parts of a plant that we had never seen before but made so much sense! Stamen can be remembered as the male part because it has the word men in it. Stigma can be remembered as the female part because it has the word ma in it. We both love learning by connecting simple truths like that! The visual, auditory, and kinesthetic processes of the video, guidebook, and activities have helped him learn more about Biology than any other course he has taken so far. The 101 Series offers two additional high school science courses as well, Physics 101 and Chemistry 101. You can purchase the entire set of 3 for $168.95 or each one individually for $69.95. Click the banner below to see reviews on those too. Find out more about The 101 Series by visiting them on Facebook, Twitter, and Pinterest.